Post-operative eye care is very important to ensure the success of any eye surgery and make it effective. A lasik surgery or a laser eye surgery is relatively quick and the recovery process is very fast. A person who undergoes this surgery can resume work within a couple of days. The doctor will advise you to take precautions and refrain from certain activities for the next few days or weeks. Post lasik, you will be given certain eye drops that are anti-inflammatory to help with the healing process. As a part of post-operative eye care, it is recommended to use dark glasses to protect your eyes from bright lights. Even protective eye wear may be used to prevent accidental scratching during sleep. This also helps to reduce dry eyes after surgery. Right after the surgery you may feel slight irritation in the eyes. Even mild pain may be experienced for which your doctor will advise pain killers. The eye sight may be hazy and take some time to return to normal. It is also normal to have blood shot eyes at this point. You will find that after a couple of days the symptoms will wane and your eyes and vision will be better. It is recommended to avoid wearing contact lenses right after the surgery. The eye care advised in the first few weeks after the lasik surgery should be followed without fail. All types of eye makeup and lotions should be avoided, especially around the eye area. Cleaning of the eyes on a daily basis should be done. It is better to refrain from swimming and saunas during the first few weeks. In fact all physical sports can be given up for at least a month after surgery. Although you can go on about other daily activities normally, remember to avoid physical strains. Your eyes should be shielded properly and you should avoid glaring lights by wearing dark glasses. Although a lasik surgery is quick and easy on the eyes, the first months of eye care after the surgery determine the quality of vision that you attain. Your vision may take anything from three to six months to become stable. It is not uncommon to experience glares and driving difficulties, especially at night during this period. You should tell your doctor if the symptoms persist after the first three months. If the symptoms worsen, then report to the doctor immediately. A re-operation may be necessary is the eyes are still not stable after the first few months or if vision problems persist. 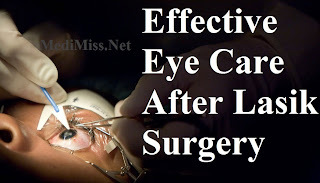 Lasik surgery for the eyes works well in most patients and has a high success rate. The process is quick and does not require staying in the hospital. However, effective eye care post-surgery ensures a higher success rate. One should follow all the eye care essentials as specified by the doctor during the first six months of surgery. Your information about laser eye surgery is very much informative and inspiring people are laser eye surgery other than wearing Glasses. Thanks for useful information. Eye Surgery in India is very effective place and reasonable place to do Eye surgery with best treatment and best surgeon who use advance technique.